PM reveals trove of intelligence on Iranian nuclear program seized from Tehran, says nuclear deal is "based on lies." Prime Minister Binyamin Netanyahu revealed intelligence from Iran's secret nuclear files Monday night. In his address, Netanyahu said that "Iran lied big time" when Iranian leaders denied that the Islamic Republic had a program to develop nuclear weapons. "After signing the nuclear deal in 2015, Iran intensified its efforts to hide its secret nuclear files." "In 2017, Iran moved its nuclear weapons files to a highly secret location in Tehran," he added, saying that the atomic archives in the Shorabad district of Tehran. "From the outside, this was an innocent-looking compound," he said. "But on the inside, it contained Iran's secret Atomic Archive locked in massive safes." "A few weeks ago, in a great intelligence achievement, Israel obtained half a ton of the material inside these vaults," he revealed. "55,000 pages, another 55,000 files on 183 CDs." He said that the files included incriminating documents, charts, blueprints, photographs, videos, and more. "We've shared this material with the United States, and the United States can vouch for its authenticity. We will also share it with other countries and we'll share it with the International Atomic Energy Agency." "We've known for years that Iran had a secret nuclear weapons program called Project Amad," he continued. We can now prove that Project Amad was a comprehensive program to design, build, and test nuclear weapons. We can also prove that Iran is secretly storing Project Amad material to use at a time of its choice to develop nuclear weapons." 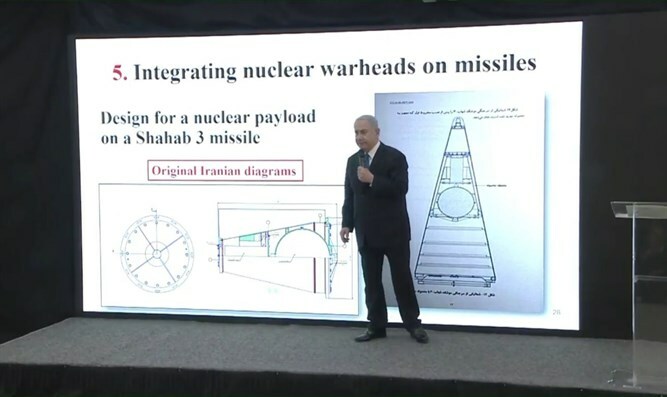 Netanyahu revealed that the purpose of Project Amad was to design, produce, and test five nuclear warheads, each with an explosive yield of 10 kilotons of TNT, for integration with ballistic missiles. "That's like 5 Hiroshima bombs to be put on ballistic missiles." He further revealed that Project Amad had all five elements of a nuclear weapons program, designing nuclear weapons, developing nuclear cores, building nuclear implosion systems, preparing nuclear tests, and integrating nuclear weapons with missiles. According to Netanyahu, Iran shelved Project Amad under international pressure in 2003. "But it didn't shelve its nuclear ambitions." "Iran devised a plan to do two things, first to preserve the nuclear know-how from Project Amad, and second, to further develop its nuclear weapons related capabilities." Many of the same personnel continued to work on Iran's nuclear program even following the shelving of Project Amad. Netanyahu accused Iran of continuing to lie to the International Atomic Energy Agency about its nuclear activities and their military applications. "The Iran [nuclear] deal is based on lies. It is based on Iranian lies and Iranian deception," he said. Netanyahu stated that "the nuclear deal gives Iran a clear path to an atomic arsenal." He addressed US President Donald Trump's upcoming decision on whether to remain in the Iran nuclear deal or not and said that he believed that Trump would withdraw from the deal. "I am sure he will do the right thing, the right thing for the United States, the right thing for Israel, and the right thing for the peace of the world."